This week I have a mystery object that’s a bit dusty and not much to look at, but which is one of my favourite historic specimens at the Horniman Museum. I have the feeling that it might stump everyone this time, but let’s see how you do. Any idea what this is? As usual you can put your comments, questions and suggestions below and I’ll give you some clues if you need them. Good luck! Not sure if the background black layer is a part of this or not. Still, the main bits look awfully like the hooklets from the suckers of squid tentacles. I have done squid hooks before: https://paolov.wordpress.com/2012/01/23/friday-mystery-object-131-answer/ but these aren’t squiddy! IF the black bit is skin they could be hooks like snakes teeth which let food or prey go one way or not the other. So maybe outer skin or inner mouth of something ? The hooks are in rows, I was wondering if they extended round the animal in a ring. I think that they may have been arranged like that by human hands, although it’s hard to be sure due to the poor accessibility to the specimen (it’s in a sealed box). There are certainly no rings of hooks around the animal though. A teasel made from cats’ claws and bitumen? Nice idea! Bit small for cats’ claws though. I was thinking of your mention of it being “historic” and someone suggesting bitumen which would be available on board ship….. so something collected on an expedition…. but why only these bits? Had the ship’s doctor had to remove them from a fellow passenger who had fallen foul of some small tropical beastie? Is it from the inside of a turtle’s throat? I know some of them have these things that stops prey getting out again? I like it as a suggestion, but nope! I was wondering if it was something like shark’s skin. Not really, although I can totally see why they are similar. I’m hopeless at visualising the actual size when something’s magnified, so I’m probably way off here, but some kind of tongue. Probably not a cat, because the hooks on a cat’s tongue are more regularly-arranged and closer than that. The black could be simply that the specimen is dried, so that doesn’t really help, but there are some dogs that have black tongues, so I’m guessing a dog tongue. I think you may be correct in that they are the barbs from a tongue. But I’m going to stick with cat and my original idea that they have been remounted in some material like bitumen. Well, the barbs on a cat’s tongue are around 0.5mm and these are a little over 2mm long – quite a difference! Dogs don’t have barbed tongues, so not one of them. Some sort of placoid scale off a shark maybe? They tend to have a broader base for attachment, but good suggestion. The hooks look kinda hollow to me, with a few flaky-looking bits at the thick end, like shed claw sheaths. Given the scale I was wondering if it could be a mounted collection of bird claw sheaths, perhaps from some famous biologist, hence the historical aspect? They’re made of a similar material and they are quite similar in shape, but they’d have to be the claw sheaths from very small birds. That would be a really weird collection! Hi Paolo! My first observation is that they look like sharks teeth! But, then why would they be together in rows like that? My next guess is that they are squamate teeth, perhaps mosasaur or some other lizard, stuck in matrix. Shark teeth in matrix? A lot of shark teeth break and fall out of the animal’s mouth (hence rows of teeth), so quite a few fossil teeth would have come from animals that were still alive. So, shark teeth in dirt? Just to clarify, I am aware that shark teeth are in rows, but they are generally packed tightly with little or no space in between. 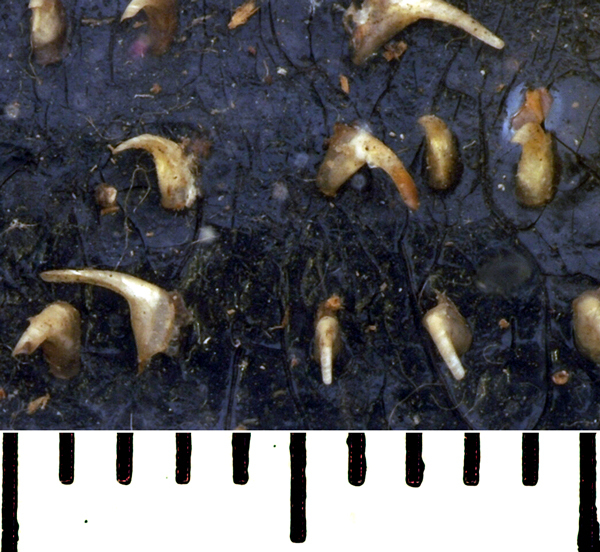 I’m guessing these are the claws of a small mammal in a matrix of some kind of very humic soil or peat. Certainly looks like that, but they’re not claws! My first idea was skin from a baby hedgehog or porcupine (or some other animal with spikes). But since you say historic, I guess it could come from a now extinct species? Raptor tongue ? Something like it was mentioned on Springwatch last night. I missed that – sounds interesting!